Dr. Laura A. Hansen is a writer, scientist, and educator committed to advancing literacy among children and young adults. In addition to her scientific publishing career, Dr. Hansen is the author of the Zombies in Paradise series. These novels, which she wrote for her two tween/teenage boys, are family-friendly and appropriate for both middle grade and young adult readers. 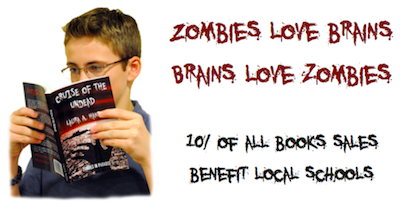 With both horror and humor, the books offer an engaging romp through exotic locales overtaken with the undead. Dr. Hansen is available for school visits on a variety of topics. To schedule a visit, contact Dr. Hansen at LauraHansenPhD@gmail.com. Dr. Hansen appears at various events to talk about writing and sign books. Come by to meet her and get your signed copy.